Ever since I was young I have loved the little stuffed cherry peppers you find at the grocery store. Admittedly, I refrain from reading the package label and just enjoy. Ignorance is bliss. Sort of. Well, when I saw that one of my favorite vendors at the Citycenter Danbury Farmers' Market was offering a dozen cherry peppers for just $2, I thought this was my chance to do a homemade version. When I told her what I wanted to do with them she even threw in a few "not so perfect looking" peppers for good measure. After all, they still taste good. Gotta love making friends with your local farmer! Normally you would remove the stems and seeds and pop the peppers in some vinegar overnight. I decided that was simply going to take too long. I wanted to enjoy these hot little bundles with my Friday cocktail, so instead I popped them into the oven to soften them up. Luckily, it worked like a charm. Slice the tops off all the peppers. Using a small melon baller (or espresso spoon) very carefully scrape out the seeds and ribs. Line them up in a baking dish and drizzle with about 1 tablespoon of olive oil. Bake for 25 minutes, just until the peppers soften (not mushy). Remove from oven and let the peppers cool so you can handle them. Wrap each piece of cheese in a strip of prosciutto. Stuff each pepper with one of the cheese bundles. Drizzle another tablespoon or so of olive oil over the stuffed peppers and enjoy! 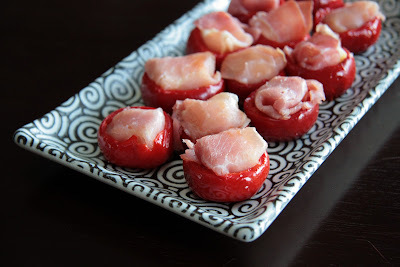 This homemade version of stuffed hot cherry peppers is definitely a keeper. They make a great spur of the moment appetizer. When I have a little more time (ahem ... patience) I would like to make the marinated homemade version, but for now these un-marinated ones certainly get a thumbs up.